Le Pen – Never Again! Keep Racism out of the Election here! 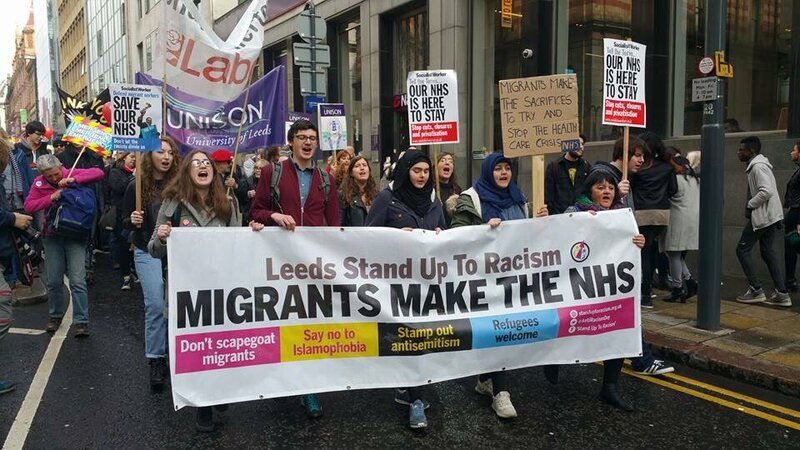 Join the Leeds Stand Up to Racism Anti-Racist Bloc on Leeds TUC May Day March to say refugees and migrants welcome in Britain. Saturday 29 April – meet 11am Victoria Gardens, Leeds City Art Gallery. The snap election called by Theresa May for 8th June raises the serious prospect of a further rise in racism. Hate crimes soared by 41% following last year’s EU Referendum, and much of the same toxic scapegoating which fueled this rise now threatens to dominate the General Election. Since the financial crisis, migrants and refugees have repeatedly been blamed for the effects of economic stagnation and austerity. In fact, migrants play an indispensable role in society and the economy, staffing crucial public services and contributing through the tax system. In the wake of Donald Trump’s Muslim Ban, the danger posed by the fascist Front National and Le Pen in France, and a shocking rise in anti-Muslim hate crime fuelled by the far-right and sections of the press here, Islamophobia must also be challenged at every point in this campaign . There is no place for racism and scapegoating in our political discourse. We call on all political leaders, media outlets, candidates and campaigns to refrain from the scapegoating of migrants and refugees and take responsibility for halting the rise of racism, Islamophobia and anti-Semitism. Ukip leader Paul Nuttall has announced that his party will campaign to ban the burka. Campaign group Stand Up to Racism have condemned the move, stating that this confirms that Ukip is determined to inject even more racist poison into the election debates. News also came today that a Ukip council candidate in Scotland has called for the guillotine, castration and flogging to be used as forms of punishment. The last couple of weeks have been busy ones for Leeds Stand Up to Racism, as can be seen from the activity we have helped to organise below – but we need to build a stronger anti-racist movement in Leeds for the challenges ahead – please see the upcoming events below and get involved! 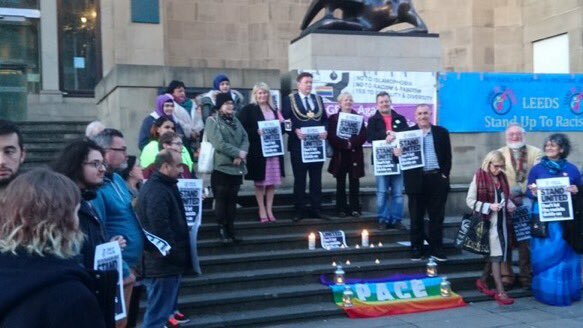 Leeds Unity vigil on Friday 24 March co-organised by Leeds SUTR jointly with MEND in Leeds after the Westminster attacks that week. Leeds Stand Up to Trump meeting hosted by Leeds Coalition Against the War – Wednesday 5 April, 7pm Leeds Civic Hall all welcome – get ready to help build the biggest protest in British history! 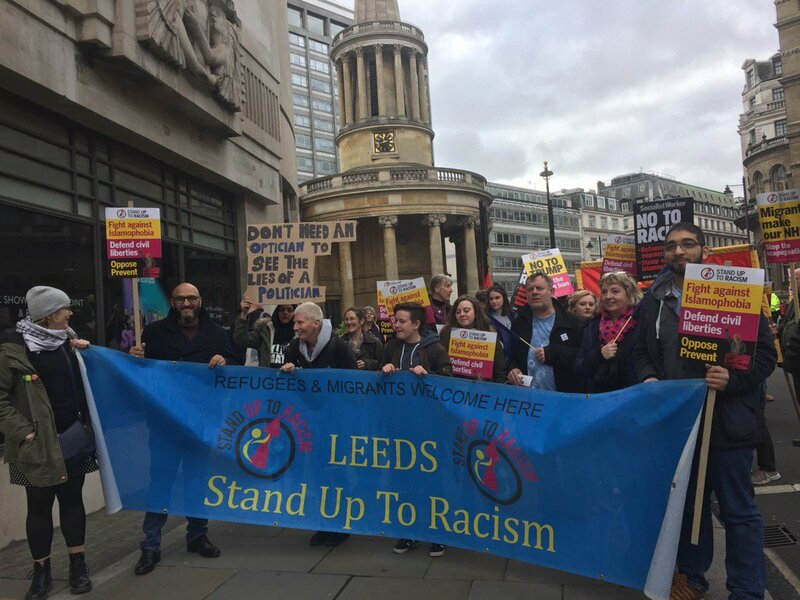 Saturday 29 April – Leeds Stand Up to Racism stall at Leeds TUC May Day march – meet 11am Victoria Gardens, Leeds City Art Gallery. As Theresa May invokes Article 50 the Tories are attempting to use the future of EU migrants as a bargaining chip and attack their rights. EU migrants are a crucial part of the fabric of society – contributing significantly to the economy, and staffing crucial public services. We need to unite in defending their rights to stay.